How to Add Ringtones to iPhone from Computer (Windows 10)? How to Add Ringtone to iPhone from Computer/Mac Easy and Fast? A customizable ringtone makes your iPhone distinct even when 3 devices ring out aloud at the same time. The reason for us introducing several ways to add ringtone to iPhone is that perhaps you don't feel like purchasing one ringtone after another from iTunes Store when your favorite singer releases a new album. How to set a song as a ringtone on iPhone 8/7 or earlier, anyway? Here're 3 ways to that end. Add/edit music play list, change artist information. Supported music format input: FLAC M4A AAC etc. The majority of the ringtone-making iOS APPs, which might work well trimming a song into a 40s episodes appropriate to be used as ringtone, simply can't apply the episode in settings if it couldn't recognize the structure of music folders on iPhone. However, it's no big problem if you add ringtone to iPhone from computer or Mac with a useful iPhone manager that directly interacts with iPhone's sound setting panel. Hence we'd recommend you out of using ringtone APPs. set a song as ringtone on iPhone. How to Add Ringtone to iPhone with DearMob iPhone Manager? Now that you 've come to learn about this ringtone-making tool called DearMob iPhone Manager, you'd better not proceed with any of the ringtone making iPhone APPs out there, take a look at how you can set a song as a ringtone on iPhone X/8/7 (Plus) with this tool. [Hot!] Check out how to set FIFA songs as ringtone here! Step 1: Download, install and launch the free DearMob iPhone Manager with superfast transfer speed on your Mac or PC. Step 2: Use a credited USB-cord to connect iPhone to computer, unlock iPhone screen with your pass code, then tap "Trust this computer" so as to make it recognized by DearMob iPhone Manager before you can add ringtone to iPhone. Step 3: Import music from computer to this iPhone manager by clicking on "Add Music"/or "Add Folder", hover the mouse over the music title when import is finished, and you'll see a functional icons - "Make Ringtone". Step 4: Click on "Make Ringtone" to start picking a maximal 40 seconds episode of music from the song & add ringtone to iPhone. Step 5: Tap on the "Sync" button at the bottom-right of software's interface, if you just managed to set a song as ringtone on iPhone, there'll be a small yellow icon saying "2". * You may play other tweaks to music already on iPhone with the functional buttons when the mouse is hovered over the music title. Edit Music: Change music/artist info including compose time, album, etc. * Kindly note that if you plan to add ringtone to iPhone, the ringtones shouldn't be longer than 40s, and that text tones shouldn't be longer than 30s. * DearMob iPhone Manager can create ringtone for iPhone out of music in MP3, AAC, M4A, FLAC, APE, WAV, WMA, OGA, OGG format. How to Add Text Tone to iPhone? If you use DearMob iPhone Manager to add ringtone to iPhone, the imported episodes of music under the 30s limit length for text tone will appear in the "Text Tone" panel for iPhone to recognize as message tones, that been said, just refer to how to add ringtone to iPhone & perform likewise to set a song as a text tone for iPhone 8/7/6s Plus. * DearMob iPhone Manager can add ringtones to iPhone without tedious iTunes components. Though many an iPhone user may cringe in front of iTunes, the often bloated and sluggish software that is still acceptable to play music, but rather a nightmare when it comes to ringtone-making or other tweaks. 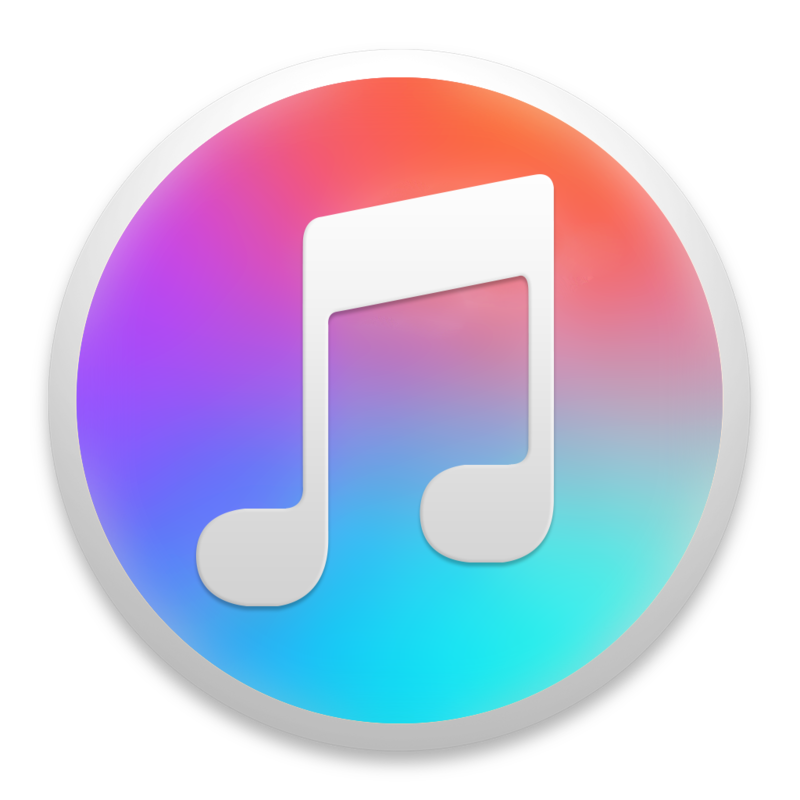 Though iTunes is a tried-and-true tool for Mac/PC to add ringtone to iPhone, it might lead you to errors like Apple Mobile Device USB Driver missing and other frequent Windows 10 iTunes problems. Step 1: Cue up iTunes on computer/Mac, USB-connect it to iPhone and unlock iPhone to help them recognize each other. Step 2: Navigate to "Songs" tab in the right-hand menu bar, if the AAC music file is already in iTunes, you can jump to Step 3; If not, drag-n-drop a MP3 or AAC music file from computer. 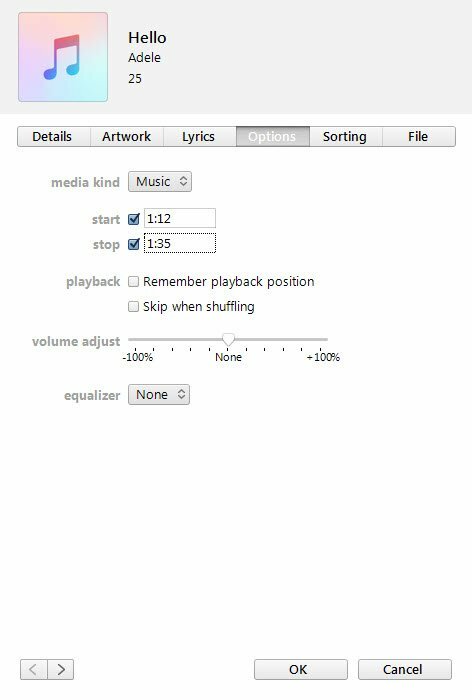 Step 4: Equalizers are optional if you want to tweak the songs a little, then click "OK" to get custom settings of ringtone done. Step 5: Now right click on the shortened song again, tap "File > Convert > Create AAC Version" to create a copy, which turns out the ringtone to be added to iPhone 8. Step 6: If you still need the feature-length song to be saved on computer without been cut, adjust the equalizer settings, start point, stop point settings accordingly. In case you confuse the longer music file with the newly-generated ringtone to be imported to iPhone, simply delete the original song (longer playback duration as can be seen from iTunes) and choose "Keep File". Step 7: Find the 30s AAC music file in its output folder, where you'll see it with the extension *.m4a, now manually re-name the extension into "*.m4r", a format iPhone can recognize as ringtone or text tone before you add ringtones to iPhone 8. Tips: To add multiple music files to iPhone 8 as ringtone, just re-do the steps above. Step 8: Now that the M4R file is created, it's much easier to add ringtone to iPhone using iTunes. 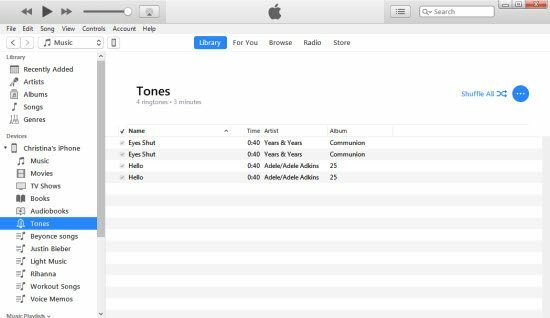 Also visit the "Tones" tab at the right-hand menu bar, where the lately-created ringtone file is displayed on top of previous ringtones files, check them all, or just select the few new files, click "Sync". Tips: In case previous ringtone files somehow lost during the new transmission process, please re-sync the files all over again. iTunes only works to create ringtone out of MP3 music, if the music files you're about to work on isn't in MP3, consider the best iPhone MP3 converter. DearMob iPhone Manager supports up to 9 music formats including MP3, AAC, etc, give it a spin if you're thinking of an iTunes alternative for Mac & Windows. Upgrade iTunes and iOS to the latest version before you start in case you effort to add ringtone to iPhone ceases half-way. 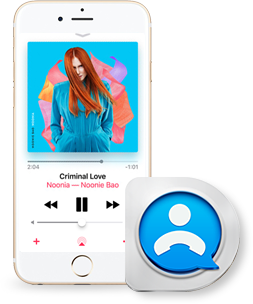 Compared to iTunes' tedious procedures to add ringtone to iPhone, it's much easier if you opt to get the help from DearMob iPhone Manager. 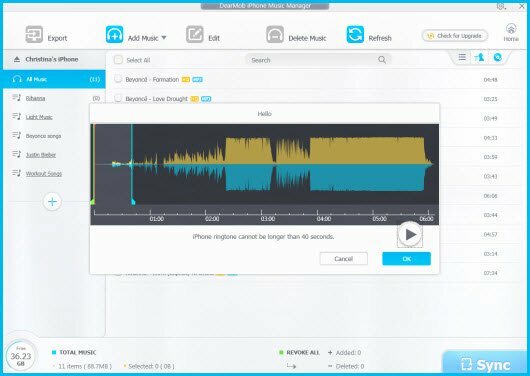 Based on a thorough understanding of iPhone's internal files system structure, this all-in-one iPhone Manager not only helps users 1-click add ringtone to iPhone 8/7/X or earlier, but also exercises smart management to iPhone music files by adding music from PC to iPhone free, or vice versa at a superfast speed in original quality. Now download to give it a spin! Best free ringtone maker for iPhone roundup list 2019! Change iPhone 8 default ringtone can be way easier than ever after reading this guide & review. Just make free ringtones from your iPhone Apple music.